I’m confused. Last year the big deal was that stores were going to open at midnight after … wait for it … the DAY OF Thanksgiving. I remember thinking then how awful that must be for retail employees, but figured at least none of them had holiday family plans for midnight. Disgusting … but in good taste. Looking out for employees and their families. Solid. This year my television is peppered with commercials that announce that “Black Friday,” in fact, starts on Thursday at 8 p.m. Seven if you’re Kmart. Actually, Kmart is so thoughtful of our insatiable consumerism that the store opens at 6 a.m. and closes at 5 p.m. and then the doorbuster deals start at 7 p.m. I don’t participate in Black Friday. I used to go every year. It was actually a fun thing that I got to do with my mom. Then there was the year I shall never forget when my dad (if you knew him, you’d know how unbelievable this is) and my brother and I all got up and tapped Kmart for a deal on a television. After our score, the three of us had breakfast at Richard’s in Warsaw as the sun came up. It’s one of my fondest memories of time spent with my brother and my dad. We laughed together at our unlikely little posse as my dad admitted that he’d actually kind of had fun. As much as Black Friday has always been about shopping, I feel like it did used to have at least a tiny drop of innocence. For me, it was never as much about the deals as it was about the experience of dragging yourself out of bed, warming up a cup of to-go cocoa, and heading out to the car in the pitch black of the night sky, your breath a white fog of Christmas magic. God, the car was always freezing. I remember the year I quit. I was driving around with that year’s posse looking for a place to park in the Best Buy parking lot off of Coliseum. The whole set up of that shopping center lends itself more to strings of profanity than strands of tinsel. I realized that day. This isn’t worth it to me anymore. Why am I here? Just because I quit doesn’t mean I begrudged others their own Black Friday experience. It was just time for me to get out of the game. Others were still enjoying the tradition, and that was fine. But now … I don’t know anymore. I don’t know what to think. My gut tells me there’s a reason that the acronym for Black Friday, BF, kind of sounds like the word “barf” if you try to sound out the two consonants. I was irritated when stores started bumping it back earlier, but I wasn’t drinking the kool-aid so I didn’t care that much. Now I guess if I had to say how I feel, it’s sad. I met a girl the other day who works at a large local retail chain. I have always been curious about the two ways you can look at the new Black-Friday-that’s-really-Thursday thing, so I asked her. She considered my long-winded question. I see her point. But I hate it nonetheless. I hate that she must take that perspective. What choice does she have? I felt bad for her and for so many others. I’m sure some are happy to do it. I’m not judging anyone for their actions for or against. I suppose I just think about how difficult it is to plan family functions once everyone starts getting married, having kids, getting new jobs, etc. Today’s family could easily attend two or three Thanksgiving events. Because we are all so entrenched, I could see a family having to schedule a 7 p.m. or 8 p.m. Thanksgiving dinner, just to be able to get together at some point. I hope that none of the Black Thursday workers are missing dinner with their loved ones, that’s all. Because it would be for the dumbest reason ever — so we can shop a few hours earlier. It doesn’t make sense. And because one store has done it, they all must do it. And while I’m up here wagging my finger around, will someone please tell me what the heck this new phenomenon is called? 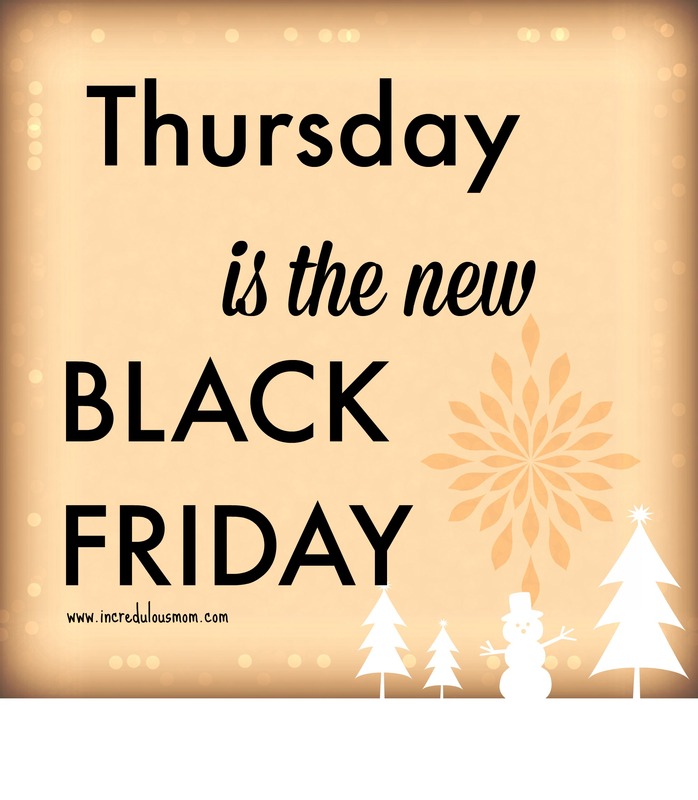 I just keep hearing, “Black Friday starts Thursday! Hurry in!” Soooo … is it “Black Thursday” then? If so, how does Black Friday feel about this? Can there truly be two black weekdays for holiday shopping? Shouldn’t it be called something else? It’s like no one thought of the logistics. Or the aesthetics. Which makes it feel all the more phony. For those of you who are ready to shop ’til you drop, enjoy! And I truly mean that. I hope you find it a time when you make memories with your shopping posse. But if you feel even a little icky, or tired, or just plain over-it, like I did on Black Friday so long ago, it’s OK to retire. You can stay home where it’s warm and cozy, sipping a holiday beverage and watching “White Christmas” as the diehards circle the Best Buy parking lot for the fifth time. Finally, to all of you who are working on Thanksgiving Day so that doorbuster deals may be had. Thank you, friends. I wish you the warmest and merriest of holidays. Small gestures. Howling at the moon. Glad you enjoyed! I’ll be nice and cozy in my own home, enjoying my family, and putting up decorations!